The Pacific Coast League released its 2018 roster of staff umpires. The PCL is one of Minor League Baseball's two Triple-A leagues, the other being the International League, whose umpires have not yet been formally announced. The 2018 PCL list of umpires features five Triple-A rookies, and two transfers from the International League. 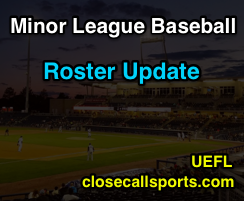 The roster furthermore features eight umpires who also appear on the Major League fill-in list and may be called up to MLB during the regular season to cover for vacationing or injured big leaguers. *Indicates umpire regularly officiated Spring Training | ^ Indicates promotion to AAA. Bold text indicates umpire is on Major League Baseball's call-up list.